Hello and welcome to day one of our Bravo Cruise diary on board Celebrity Silhouette, the performing arts at sea cruise. Pop in each day to see how we find life onboard with a 12-year-old. We don’t often cruise from Southampton, preferring to fly out to Barcelona, however the benefits of cruising out of Southampton are huge. Southampton is a 4.5 hours drive from home making travel day a pleasure rather than the stress of a super early flight or overnight stay. Which has never felt like an issue, but yesterday not having to do that made the day so much more chilled. Check-inn was smooth and organised and from port to ship took less than an hour. Allowing us to get on board to watch the Royal Wedding with a glass of fizz to celebrate and toast the new addition to the royal family. On first impressions the ship is immaculate and very stylish. 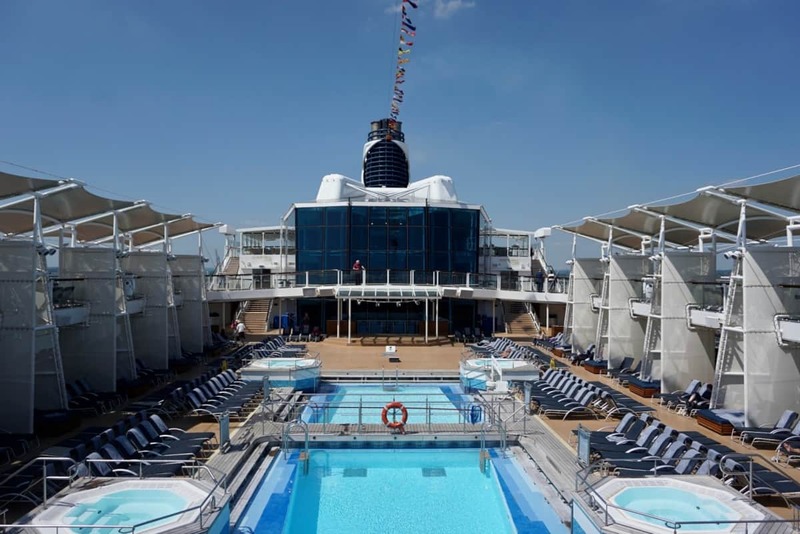 Touches such as padded sun loungers make the Celebrity Silhouette feel very opulent. After some time exploring the ship and Joe beating me at a game of basket ball we enjoyed a glass of wine whilst he splashed in the pool. The one minor negative is that apart from 3 hours a day Xbox play there are no activities arranged for children and the kids club is closed, having cruised many times this is the first time we have experience this. 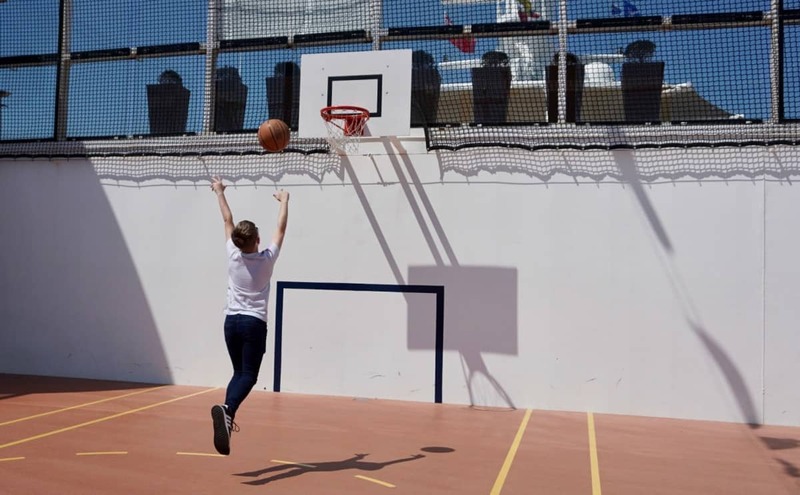 Meaning we will be unable to share kids facilities onboard Celebrity Cruises. I imagine this is due to the low-level of children on this sailing. We spent the evening enjoying a delicious dinner and playing UNO as we listened to the most wonderful artist singing songs from the movies. The food and service onboard is exceptional and Joe was thrilled as escargot was on the menu, which is one of his, all time favourites. Cruising is the perfect way for children to experiment with food and develop their palate. We have always had a rule that we must all try a new dish on every cruise/holiday. And the boys have always embraced this, especially Joe, cruising is the perfect place for experimenting with varied menus and such wonderful service, allowing you to order another meal if you make the wrong choice. Tomorrow we have a sea day, so we plan to explore the ship and spend a bit of time chilling around the pool, and tomorrow night we are scheduled to see Alfie Boe excited is an understatement. Pop in tomorrow to see how amazing Alfie is, because lets face it? That is a given. Now read day 2 of the Bravo Cruise.